The other week - you may remember that we were having an anatomy scan... which can be read about here! Unfortunately when I shared it on Facebook - it was so close to our elections (like the day before), when I said 'Blue', some folks thought I was talking about who I was voting for *grin*!!!! Not quite - the little man we are growing is SO much more important than those elections (and SO much more exciting as well *grin*)!!!! But one lovely friend had been following closely and understood it right from the start... next thing I know, there was a cryptic message telling me to watch and wait as a special delivery was on it's way. Yep - my lovely friend Cat from Catalina's Cottage ordered a gorgeous 1980's All Black Doll from Dee at Dee-Construction for us as soon as she heard we were going to have a boy! I had been coveting one of Dee's dolls for a long time, she is one of the most talented ladies I have come across (as is Cat - you should see the Christmas Quilts she made her kids, WOW)! 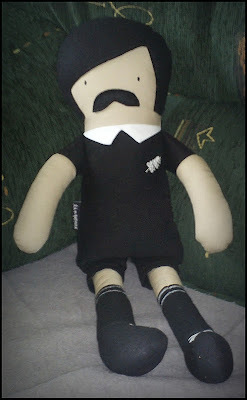 And being All Blacks fan's - she couldn't have picked a better doll to send us! Thank you SO much Cat - we love it, and we'll make sure our wee man knows where it has come from, and will treasure it! Mr. C still can't get over your generosity; he is in awe (but totally LOVES it also)! I have had to hide it away, as one wee Button also had her eye on it, and kept cuddling it - cute, but not for her! So it has been quietly popped away until our wee man makes his appearance; I am so excited he'll be getting something brand new all of his own! OH so jealous! Dee's dolls are fab and I particularly liked the old-school rugby ones. 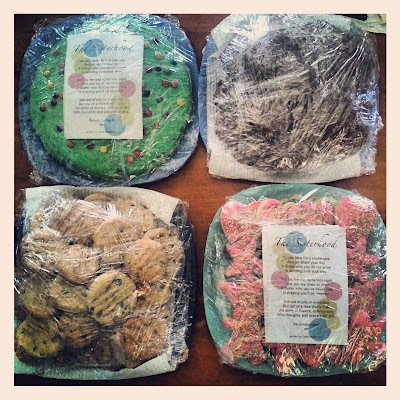 What a lovely gesture from Cat, and I'm sure your wee blue bundle will love it! What a blessing. He looks fabulous.